Let’s talk about storytelling and stakes this week, because they’re topics that seem to define the Raw and Smackdown! Live reviews here at The A.V. Club, and with good reason (check LaToya’s ‘Stray Observations’ in this week’s Raw review for more). For a few weeks now there’s been a growing divide between the matches and feuds on Raw and the ones on Smackdown. While the Red show has been giving away PPV matches and spending time on meaningless segments, the Blue show has been using just about every minute of its two-hour runtime to build a brand where wrestlers are all engaged in feuds that matter. Smackdown! Live has done a tremendous job of building a show where everyone in the locker room feels part of a whole, rather than random individuals vaguely fighting for the same thing. Where Raw only hints at the idea that these Superstars are competitors who want to be on top, who want to be the main event draw, Smackdown! makes this clear each and every week. That’s because Smackdown! is telling a simple, but effective story in its episodes. Imagine that, a TV show treating itself like an episodic story. To be fair, unlike iRaw, Smackdown! has the benefit of a clean slate. That clean slate means that creative can focus on not only building on the past work of some of the show’s biggest superstars, but also work to establish the new talent as credible threats. Doing that all comes down to how Smackdown chooses to tell individual stories. Think about your favorite TV shows, books, or movies. Typically, they don’t focus on just one or two characters at a time, removed from the rest of the story. Rather, every character is part of an evolving tapestry, and plots threads overlap, interconnect, and work to enliven one another. That’s how you craft an engaging story on all fronts, and that’s what Smackdown! Live is doing thus far. It’s all about storytelling and stakes. Smackdown! even has better titles. That starts with taking what happened at your PPV and showing that those matches have consequences that reverberate through the show and the locker room. 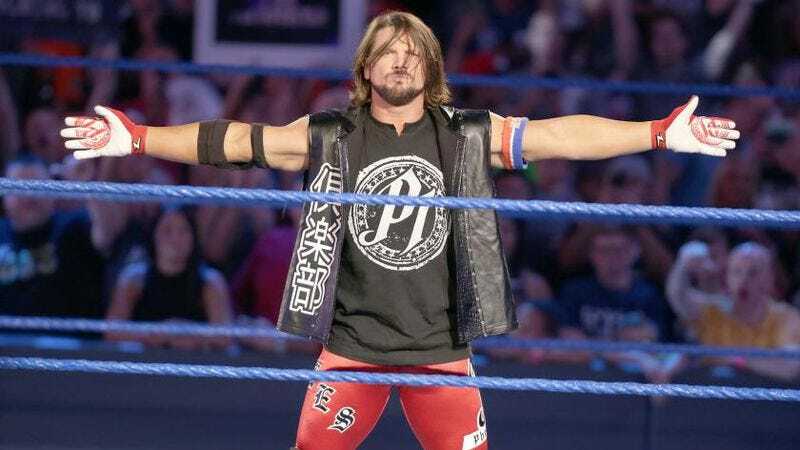 Smackdown does that right off the bat this week, as AJ Styles walks into the locker room, where a few superstars are hanging out and chatting, and lets everyone know that he’s the face that runs the place now. Then, a number of superstars are in the ring, gathered around to learn about the new Smackdown! Tag Team and Women’s titles. As GM Daniel Bryan states, this is a show about opportunities, and the roster is about to get ample opportunity to compete for prizes. That gets back to the idea of stakes. Not every match needs to be about the chance to compete for a Championship, but the mere idea that all of these superstars could rise to the top means that stakes are inherent in every match because everyone is trying to prove themselves. What makes this week’s Smackdown! such an impressive and near-flawless two hours is the way SummerSlam reverberates throughout the night, and the way a story is told from the beginning of the episode to the end. That sounds like such an obvious thing to point out, but as we know, sometimes (often?) WWE misses the obvious. So, when Ziggler and Styles clash at the beginning of the show, and Daniel Bryan comes out to hype a match between them to determine how the Backlash main event will shape up—don’t sleep on how Bryan is excelling at this new role, folks—there’s plenty of great character motivations behind the match. This isn’t just mindless booking that doesn’t pay attention to actual match results and trends (I’m looking at you, Raw and Roman Reigns), but rather booking that’s in tune with the recent past. Styles deserves a guaranteed shot at the title because he, say it with me, BEAT UP JOHN CENA, and Ziggler gets a chance to get in the match based on his performance at SummerSlam. That’s crystal goddamn clear, which is a good look for a WWE program. It’s part of what makes NXT so enthralling, and their Takeover show must-see from top to bottom. Then, Styles and Ziggler bring that storytelling to the killer main event. Styles wrestles like a cocky guy who just dethroned the top superstar in the company in a MOTY candidate, and Ziggler wrestles like a man with something to prove; okay, that’s usually how he wrestles, but you get the idea. It’s an aggressive, urgent match, and it’s because of sound booking that makes the in-ring psychology easy to follow and engage with. No more talk on the way to the ring. Carmella is all business. That kind of clarity courses through the entire two hours. Take, for instance, the two Women’s segments from tonight. They’re not the longest segments, but that doesn’t matter. Giving the Women more time to work is always going to be a good thing, but it’s the quality and attention paid to the segments that really matters, and that’s why the Carmella vs. Nikki segment is pretty much perfect. Nikki is back on the roster after returning at SummerSlam, where she established that she’s still a force at the top of her game. So, naturally, the fanfare is all about her. Her in-ring return is hyped before the commercial, and Renee Young is in the ring to interview her before her match with Carmella. Then, Carmella lays a beating on her before the match can even begin, finishing it off by laying Nikki out with a Bella Buster (or a Mella Buster, as she referred to it on Twitter). It’s booking that accomplishes exactly what you want when you’re trying to make the whole roster look great. It builds anticipation for Nikki’s actual in-ring Smackdown! return, and it makes Carmella look like a legit talent who can get one over on the former champ. Smackdown! is filled with these kinds of simple but interesting decisions, and it makes everything feel fresh and exciting because it’s actually tied to character progression. I mean, any show that actually makes the Ascension look like threats has to be doing something right. But seriously, there’s an urgency and, for lack of a better word, presence to every segment. Something is being accomplished, or built towards, or hinted at. That’s the building blocks of great storytelling. First, you tease something big, like with Bray Wyatt confronting Randy Orton and then disappearing into the night, or Heath Slater searching for a tag partner. Then, you follow through with meaningful matches, like American Alpha and Breezeango both looking like they deserve to move on in the Tag Team Tournament, and Alexa Bliss looking tough against Becky Lynch. Then, you pay it all off with something epic that people are emotionally invested in, like Styles and Ziggler fighting for a title opportunity at Backlash. Sometimes it really is that simple. Smackdown! Live understands this, creating something truly streamlined, engaging, and important week after week. Results: Becky Lynch defeated Alexa Bliss; The Usos defeated The Ascension (Tag Team Championship Tournament); Carmella vs. Nikki never got started; American Alpha defeated Breezeango (Tag Team Championship Tournament); AJ Styles defeated Dolph Ziggler. Why is Jey Uso wrestling in a sleeveless hoodie? Why do the Usos do anything they do? I love Bray Wyatt interrupting Orton not because it sets them up for a match—that too!—but because it’s another example of Smackdown! Live disrupting the normal, expected narrative beats. Becky Lynch openly laughing at Heath Slater’s performance tonight is just too much for my heart. For real though, he was on fire. How about those false finishes in the main event? Beautiful. American Alpha are going to buy thousands of new singlets if they win the Tag Team Championship Tournament. They continue to be perfect. So, for those who skipped the show, it’s Styles vs. Ambrose for the WWE World Championship at Backlash, along with the conclusion of the Tag Team Championship Tournament, while a Six-Pack challenge at the PPV will determine the first Smackdown! Women’s Champion. Lots to look forward to. By the way, after this review was written I went back and watched this week’s Talking Smack because folks were buzzing about it. Go watch it immediately, and not just because it confirms what your friendly A.V. Club wrestling writers have been saying all along: The Miz is extremely underrated.